Winona Forest is a popular training and racing ground for sled dogs. An area that boasts the most snow east of the Rockies, draws mushers to the forest from the northeast and Canada, and as far as Virginia and the Mid-west. Annual sled-dog races such as the Tug Hill Challenge are held December through February at the CCC Camp in Winona Forest. On any given day in the forest,whether you are skiing, snowmobiling, snowshoeing or camping (yes, camping...in igloos) ,you may meet with teams of sled-dogs training for these events or just out enjoying their sport. It is an awesome sight that will stop you in your tracks! Please yield their passage ...they are on a mission!You will see many breeds running on the trails of Winona including purebred Siberian Husky. The best personal trainer is your furry best friend! Get active, get healthy and get going – Watch for WFRA clinics on cool canine activities offered later this year that’ll get you and your dog moving. If there is enough interest we can schedule group events and competitions. Canicross: Any size dog who enjoys a good run will enjoy canicross, which is a run with your dog joining in on the fun. Your dog runs ahead of you, on a 6 to 8 foot bungee leash. Dogs participating in canicross wear a properly fitting, padded harness to keep them comfortable. This is a hands-free activity, so your dog is attached to your waist, via a canicross belt. Not a runner? Hiking is a great option. Snowshoeing: You’ll need a hand’s free leash for this workout as well. You may need to break trail for your dog by taking the lead, and come home even more tired. 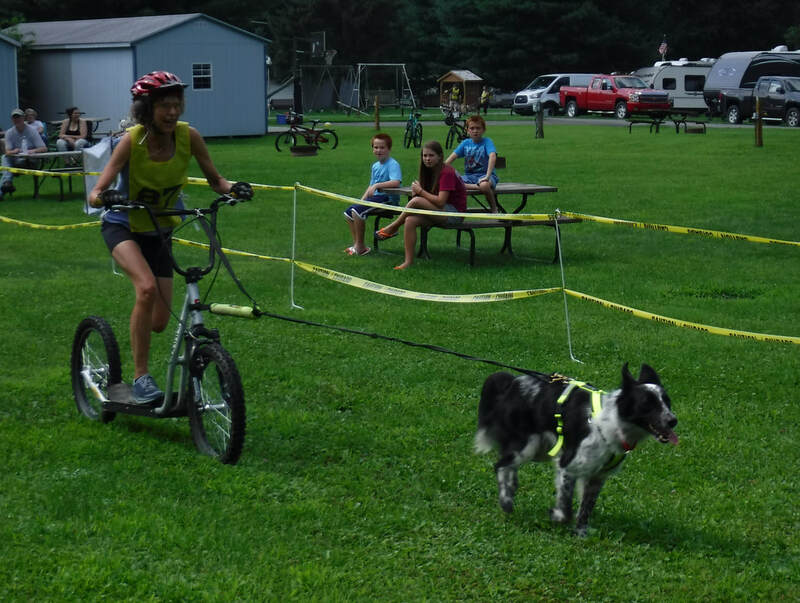 You can take up the sport of bikejoring, or dryland scootering where your dog and you work as a team to fly down the trails. For those of you who feel more comfortable in the slow lane, there are a number of products you can attach to the side of your bike and the two of you can go exploring! Remember, that the bike gives you a mechanical advantage, so your dog has to work harder than you are. Go easy and pay close attention to your dog. Skijor: All you need is a little bit of balance, a willing dog over 30 pounds, a pair of skis, a harness, a gang line and a hip belt. Hit the winter trails in style with your dog leading the way. Basically, skijoring is cross country skiing with your dog – he adds some pull, and helps set the pace, while you burn up the calories following your dog. A great winter workout that is sure to work up a sweat. Not a skier? Check out kicksledding. If plan to make your dog be your workout partner, get him a check-up with his vet before you start too heavily into the exercise routine. Always tell someone where you are going and what time you expect to be back. Check the weather before you go, and bring the right supplies for you and the dog. Please respect other trail users and keep your dog on a leash. Use the proper gear, stay safe… and have fun! _Trails are maintained by the all-volunteer Winona Forest Recreation Association. Become a member to support the maintenance of this beautiful resource.